Thanks to interest shown by the Russian Defense Ministry and the Ministry of Emergency Situations, the Russian military is soon to take charge of a number of remote-controlled airships. Developers are confident of good prospects for the Russian blimp industry, though they admit that the flying machines have limited scope and that civilian use is unlikely. Plane enthusiasts may soon be seeing a craft in the air above Russia that has not been seen since the early 20th century – the airship is to make a return to the country’s skies, though in a pilotless form. Russia’s very first unmanned DP-29 blimp, manufactured by the Dolgoprudny Design Bureau of Automatics, underwent factory testing in early September at a specialized airfield in the city of Kirzhach in the Vladimir Region. The dirigible took off and landed both manually and automatically during the tests, and the testers simulated interaction to calculate the airship’s readiness for flight, the design bureau said on its website. Now that the DP-29 has been tested, a few bugs are being fixed, according to news website Lenta.ru, referencing the design bureau’s Deputy CEO Alexander Kolesov and citing RIA Novosti. According to Kolesov, the DP-29 will be used in the interests of the Defense Ministry and Ministry of Emergency Situations. This classic cigar-shaped Russian blimp is capable of reaching a height of 3,300 feet, carrying a load of up to 10 kilograms, and being flown independently for up to three hours. The Russian military establishment is interested in this long-forgotten airship because a dirigible requires less fuel than jets and helicopters, has a higher lifting capacity, and is environmentally friendly and quiet. According to Yury Vopshin, chief designer at Dolgoprudny, blimps are ideal for reconnaissance and patrols because they can stay in a given area for a long period of time and perform surveillance. They can also serve to organize ultra-long radio communications and even act as a radar station for air and missile defense. The aircraft do not need airfields with long runways because they take off and land vertically. 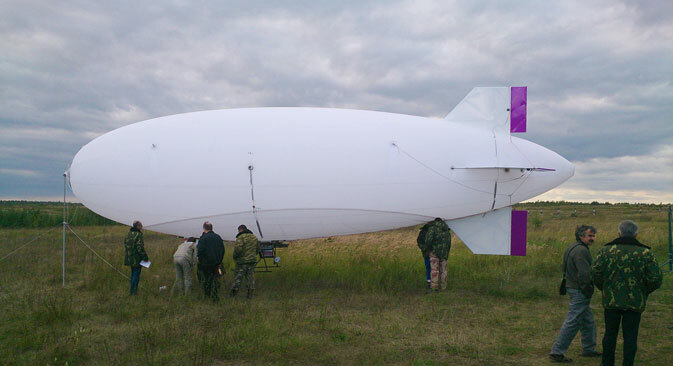 The Russian military has already shown interest in another development by Dolgoprudny: the unmanned DP-27 Anyuta blimp. According to the Defense Ministry, this model is suitable for reconnaissance. This aeronautical machine is basically an enormous flying saucer with a camera that transfers data back to mission control in real time and real scale. The DP-27 Anyuta’s flight range on full automatic is only 6 miles, but it is capable of climbing to 3,300 feet. The DP-27 Anyuta debuted at the MAKS air show outside Moscow in 2011, but during testing several bugs were discovered and it was sent off for further tweaking. However, its developers think they will be able to unveil an airship with improved features within two years. Aeronautical technology is barely used by the military right now (the Russian Air Force’s aeronautical service was disbanded a few years ago), but the spirited interest that the military has been showing in unmanned dirigibles is evidence that this is a highly promising type of hardware. Private design bureaus are also developing the unmanned craft. According to Alexei Mitrofanov, a spokesman for the Augur Aeronautical Center’s private design bureau, his company is also developing technology for the Defense Ministry. He declined to provide further details, citing secrecy. “There are no technical limits in the use of unmanned blimps,” Mitrofanov said in an interview with RBTH. “However, there are several legal hurdles. We still lack regulatory documents for the use of unmanned apparatus, and that is a serious problem, especially for the use of unmanned blimps in the civilian sphere,” he said. Augur is developing the unmanned Sokol medium-altitude apparatus for civilian use. It is designed to perform extended patrolling; according to its creators, it is capable of staying in the air for more than a week. However, at this point Sokol only exists on the drawing board. So despite the encouraging prospects and advantages to using unmanned blimps, it will still be some time before they become a regular occurrence in Russian skies and attempt to enter foreign markets. When asked by RBTH, Alexander Kolesov told Dolgoprudny is not yet considering exporting the DP-29.